Featuring an impressive all-kid, all-British cast! The cast of This Boy Tom. BOTTOM LINE: Excellent performances from an all-kid cast are the big selling point for This Boy Tom, a confusing new musical transfer from the Brighton Fringe Festival. Welcome to a world without grownups. That’s the apparent landscape in This Boy Tom, an hour-long new musical about bullying. It's part of the Fringe Encores series, which stages shows that have appeared in various international theatre festivals: This Boy Tom is a Brighton Fringe Festival transfer featuring a terrific cast of British kids. As far as the performers are concerned, who needs chaperones? These ten kids sing marvelously, especially when the voices blend in powerful, full-company unison. There’s especially sensitive musicianship from Eliot Milward and Frankie Milward as brothers Tom and Alfie (one’s alive, one’s not) whose mysterious family tragedy lies at the center of this story and has left Tom with a scar that seems to be a magnet for bullies. But when it comes to crafting a credible tale, This Boy Tom’s characters sorely need some adult supervision. The middle schoolers’ teacher exists only as a projected shadow, reminiscent of the Peanuts’ “wah-wah”-voiced instructor. But in You’re A Good Man, Charlie Brown, the adult-less musical of the Peanuts cartoons, the kids are dealing with kid-sized problems. This Boy Tom is as much a story about trauma and loss as it is about mean classmates, and the adults aren’t hapless or unhelpful in addressing these very grown-up issues—they’re just unaccounted for. Whereas Matilda (to which this show owes a clear debt) pointedly explored the failure of adults to understand the children in their care, This Boy Tom’s insistence on totally ignoring all the potential sources of support unmoors the show from reality. So too does the speed with which Natalie Sexton’s book sketches the students’ relationships and motivations. Although new girl Flora (Clara Shepherd-Thompson, who sings winningly and even skillfully accompanies the cast on the piano at one point) has taken a shine to outcast Tom, she instantly reverses course and becomes supremely nasty once she’s informed that her new friend acquired his scar in a terrible accident. Why? No time to explain. A longer, more developed version of This Boy Tom might have taken the opportunity to dig deeper into either Tom’s trauma or the school-wide bullying epidemic instead of scrambling to do both in so few minutes. Sexton also somewhat undermines the universality of the show’s lessons about bullying by making the causes of the children’s cruelty so bizarre and specific: meanie-in-chief and power belter Jess genuinely believes, until the show’s melodramatic denouement, that Tom has murdered a child. We can probably, in that extreme case, forgive at least a little of her wariness. There’s a lovely choral number, the highlight of Sexton’s efficient pop-driven score with touches of Sondheim, in which we see each member of the talented cast in isolation: “I am safe when I’m in my home,” they sing, revealing their secret nerdiness or love of dance or, contrary to the lyrics, their fragile family life. In those fleetingly touching moments, faced with the children’s passionately voiced despair, we’re reminded that these kids—both onstage and off—deserve better. This Boy Tom is written and directed by Natalie Sexton. 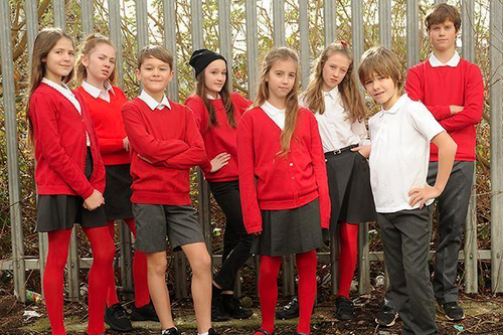 The cast includes Eliot Milward, Frankie Milward, and Clara Shepherd-Thompson.